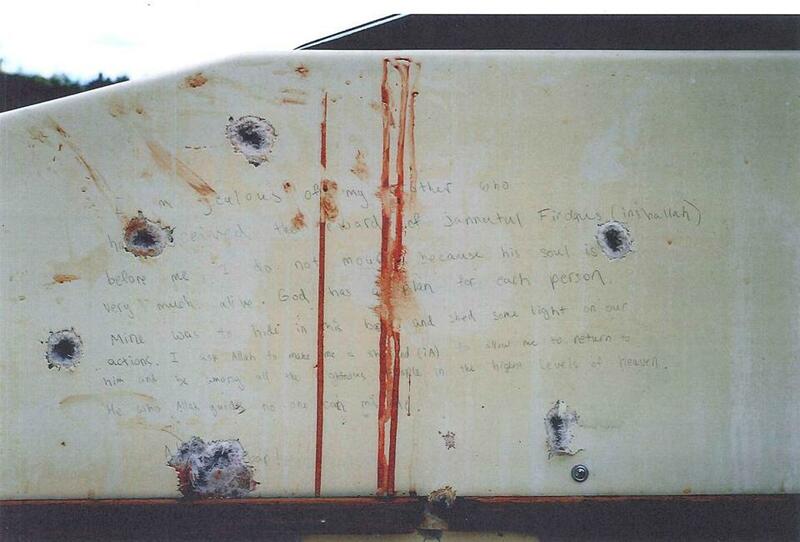 Accused Boston Marathon bomber Dzhokhar A. Tsarnaev’s writings as he hid inside a Watertown boat were presented to the jury in US District Court in Boston, where Tsarnaev is on trial for his role in the April 15, 2013 bombings that killed three people and wounded 260 others. On Tuesday, Boston Police Officer Todd Brown, a member of the department’s bomb squad, testified that he searched the boat parked in David Henneberry’s back yard to make sure that there were no explosive devices in it after Tsarnaev was discovered hiding there. No bombs were found, but Brown said he did notice some writing in pencil, words that were partially obscured by blood stains at some points and pocked with bullet holes in others. These photographs were taken inside the private boat that Dzhokhar A. Tsarnaev was hiding in before he was captured by police in the backyard of a Watertown home on April 19, 2013. 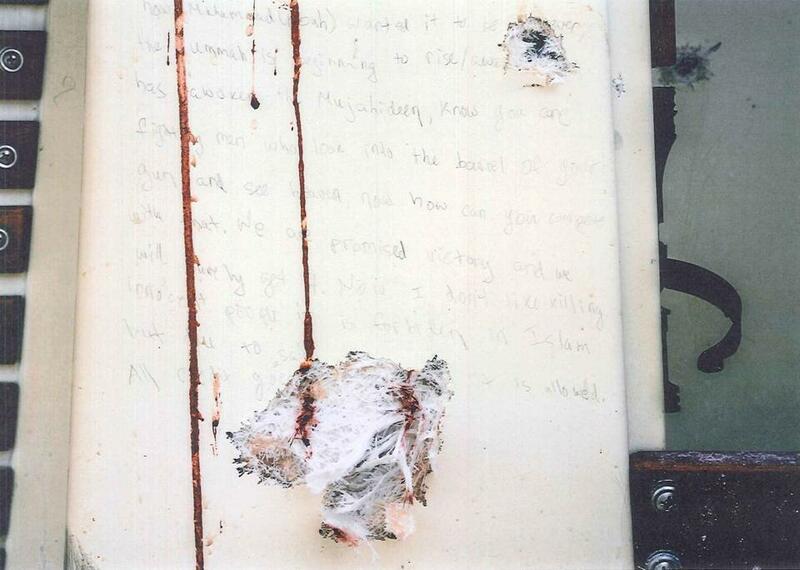 Tsarnaev wrote the notes with a pencil. 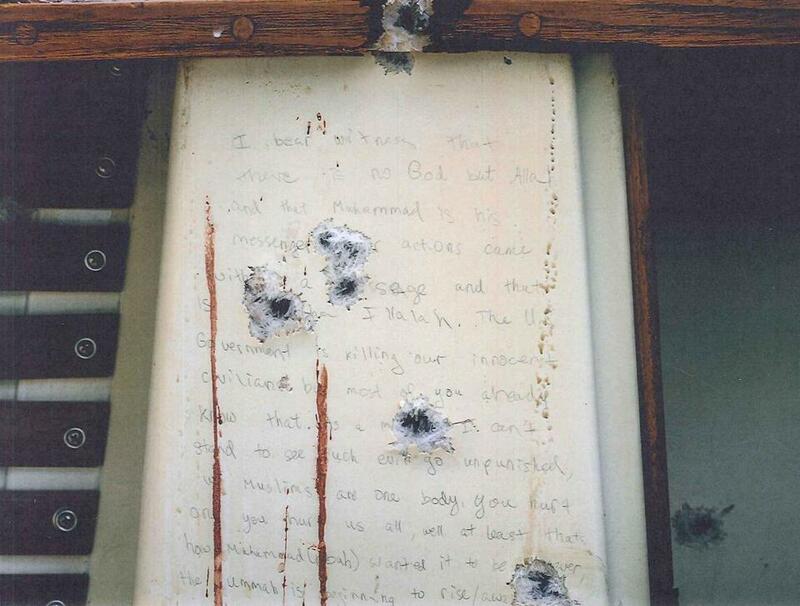 The bullet holes are from shots fired into the boat by police, according to a witness who testified Tuesday about the discovery of the writings. ha (hole) ceived the reward of jannutul Firdaus (inshallah) before me. I do not mourn because his soul is very much alive. God has a plan for each person. Mine was to hide in his boat and shed some light on our actions I ask Allah to make me a shahied (iA) to allow me to return to him and be among all the righteous people in the highest levels of heaven. is (hole) ha Illalah. The U.S.